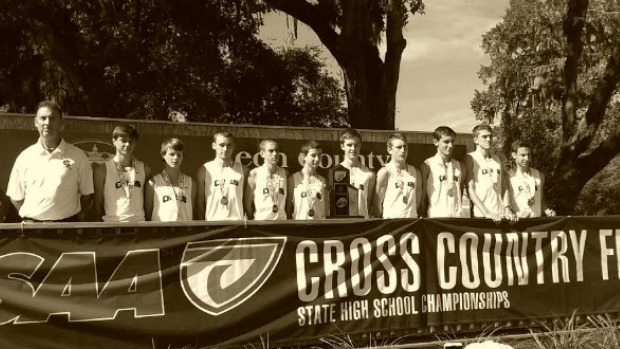 The Chiles boys from Tallahassee top both the 3200m and 1600m lists looking into next year, but for anyone that has been paying attention, you'll know that they started making their case becoming the top squad in Florida a year ago. These Timberwolves made a lot of noise by winning last year's FSU Pre-State Cross Country Invitational, the first Florida boys team to beat Belen head-to-head in the last three seasons or so, which was followed with a State Runner-up finish to cap their 2013 XC season. Jumping into the 2014 track & field they stepped it up a notch as they became the 2nd best 3200m and 1600m squad in Florida and they brought home the 3A Track & Field State Championship in major fashion. The 2013 3A State Runner-Up Boys Team from Chiles HS with Coach Scott Gowan.